Tyrannian Victory Day is upon us and it is a wonderful day to celebrate the end of one of the darkest marks in Tyrannia's tumultuous history. This is a day that we gather together and mourn those who were lost in the great war and that we celebrate those who were able to take down the terrible forces. This war happened many, many years ago and young Neopians today don't seem to know much about this terrible time. Before we dive into the tremendous ways to dress yourself up, I wanted to give you a brief history lesson! Back in March of 2001, a horrific earthquake rattled through Neopia. It destroyed a lot of land, but it also cracked a deep chasm into the floor of the ice caves. After the dust had settled and things seemed to have stablized again, a group of brave Neopians ventured into the darkness of the chasm. As they explored further, they noticed a tunnel had emerged. This tunnel was very suspicious as they didn't expect anything to be beyond the ice. The tunnel turned from moist and wet near the ice to a dryer and warmer environment, until eventually they were halted by an incredibly thick array of vines and roots blocking the path. After a bit of time, a mysterious group of creatures (now known as the Chomby) ate their way through the vegetation and led the explorers through, opening up the way to the prehistoric land of Tyrannia. Of course, with every newly discovered peaceful land, an invasion had to take place. A great beast named the Monoceraptor was announced, and it pledged to crush and conquer Tyrannia and enslave all of it's residents. Whoever was controlling this Monoceraptor had also been able to indoctrinate an army of Tyrannian soldiers to work from the inside, legions of Korbats and Grarrls were being challenged in the Battledome by brave Neopians fighting for liberation. After taking out hoards of opponents, one brave Lupe rose above the rest and was able to defeat the Monoceraptor. Legend has it that the owner of this Lupe was able to choose any item in the whole world as his reward. Tyrannia became liberated on that day and has lived in peace every since. The kind Chomby are able to feast on vegetation, hungry Neopets can go collect some free omelette, and many enjoy the games available (as frustrating as Tyranu Evavu is). And every year on this day the world comes together to celebrate! One of my favorite ways to celebrate is by dressing up! 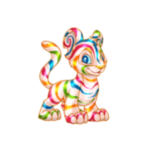 I've compiled a wonderful little list of items that your Neopet can wear to show their support for this prehistoric paradise! How could you skip out on this fabulous hat? Based on a Tyrannian Aisha, this cone hat screams "I'M SO GLAD TYRANNIA WAS LIBERATED!!!" You really can't promote the cause better than this!! If you are looking for a headpiece slightly less flashy than that party hat, consider a Kauvara Costume Hat. Why a magical Kau from Neopia Central? Well, Kauvara was actually a crucial part in the victory and aided countless Neopians in their battle. She originally cut prices on all her Healing Potions in half during the war, and then went a step even further and donated tons of potions to the Money Tree when the Monoceraptor was on its way! This helped a lot of Neopets heal from battle and get back in the dome quickly to take down the feracious beasts. The turmoil of Tyrannia is long past and now Neopians with a darker sense of humor like to look at the comedy of the situation. This little Kacheek is panicking, whether it's from an erupting volcano or a Grarrl Battlemaster is up for debate, but he's so adorable! It's the perfect trinket to give to your pet...though it might be a bit off-color if that pet happens to be a Grarrl. This is a recreation of the flora found in the tunnel that the Chomby were feeding on, and is the type of vegetation found all around the land. This will make your pet feel like he is in the thick of it, almost too thick...quite possibly making him feel claustrophobic and unable to escape. However, giving this foreground to a Chomby will make them quite happy, and you may not have to feed them for a while as they'll have plenty to feast on!! This top is not day wear by any means, but it is perfect for when the night rolls in! It's great for going out to all the clubs and hottest parties, and the perfect thing to wear when you head out to the Tyrannian Concert Hall. It's classic Tyrannian stitching but with a modern flair and more modernized colors, an homage to the old and the new. You'll be serving glamor for days! During all the festivities you are going to want to stop for a bite to eat, and what is better than a picnic! Spend the morning making your favorite sandwiches, pack some hummus and chips, and sling it over your shoulder! Find the perfect dirt patch on a cliff with a view and have an amazing time with your friends overlooking the canyons! Don't have time to actually make lunch? Stuff it with any omelette you can steal from the Giant Omelette! What is more Tyrannian than that!? Were you one of the recruits all those years ago who fought hard in the war? Wear it with pride with this Tyrannian Army Cap. It's the perfect thing to say "hey, I was there, I lived this" and Neopians will pay their deepest respects to you. Expect a day full of salutes, thank yous, and people giving you omelettes to show their deepest regards. You were one of the fighters, you are responsible to helping Tyrannia be free and be what it is today. And for your great strength, your risk of sacrifice, I say thank you, and I salute you! I hope you know how great your contributions have been and how grateful we all are for your service.